When the time comes for strategic planning, it can be hard to know which framework to choose for your organization. Since popularized in the late 1950s, hundreds of strategic frameworks have been developed and used by organizations of all types, sizes and stages in their business life cycle – most promising to be a silver bullet to strategic success. We’ve done the research to highlight some of the most popular strategic frameworks over the past 60 years to help inform your decision of which framework best fits your organization. OGSM (short for Objectives, Goals, Strategies, Measures) is widely believed to have been brought to America from Japan in the 1950s with roots in Total Quality, but the precise origin of the framework is unknown. It is believed to have been developed post-World War II during the Occupation of Japan. Procter & Gamble is credited with the development of the modern version of the OGSM framework, which translates strategic goals and ideas into organizational practice. Since implemented by P&G, OGSM has been used by Fortune 500 companies around the globe. OGSM provides a concise format (one page) and clear framework for developing, aligning and deploying a long-term (3-5 year) strategic plan. The OGSM framework is designed to connect big picture strategic elements (mission, vision, values) to operational elements (goals, strategies, initiatives, measures). The result is a comprehensive, robust and executable strategic plan. Objective – direction setting statement. Answers the question: Where are we going? Goals – financial and operational performance goals. Answers the question: What must we accomplish financially? Strategies – choices made to achieve our objectives and goals. Answers the question: How will we prioritize our choices? Measures – quantitative figures used to track progress on each strategy. Answers the question: How do we measure success? 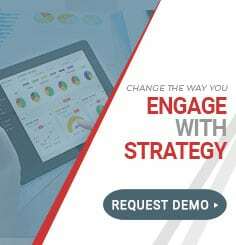 Best for organizations with no formal strategic framework, those who have experienced rapid growth (or rapid decline), entities who have currently undergone mergers/acquisitions or any organization who continually struggles to reach its financial targets. 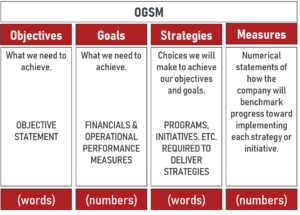 At ArchPoint Consulting, we regularly recommend the OGSM framework for our clients because of its power to transform the way organizations think about and execute strategy. Read our OGSM Whitepaper for more information on implementing the OGSM framework in your organization. Perhaps not ironically, he’s also credited with famous phrase “paralysis by analysis,” words of caution to heed when embarking in a planning exercise. Market penetration – Increased sales of existing products in existing markets through changes in price, promotion and distribution. Product development – Sales of new products in existing markets through new product development or existing product modification. Market development – Sales of existing products in new markets through changes in price, packaging, distribution and geographic expansion business locations. Diversification – Sales of new products in new markets through related diversification (diversification within the same industry) or unrelated diversification (diversification in a completely new industry). Best used in conjunction with a more robust strategic planning framework, due to the lack of consideration of external/internal factors that need to exist/change to deliver growth. Communicating the actionability of activities to follow the chosen strategy can also be a challenge. 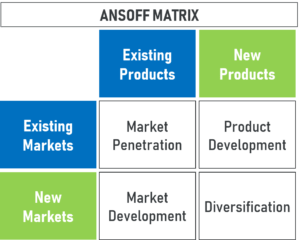 At ArchPoint Consulting, we frequently refer to the Ansoff Matrix to inform OGSM development and distributor/customer segmentation exercises for product-based companies. Like OGSM, Hoshin Kanri can be traced to post-World War II Japanese reconstruction efforts. The name stems from the Japanese “Ho” meaning direction, “Shin” meaning needle and “Hoshin” meaning compass; “Kan” meaning control or channeling and “Ri” meaning reason or logic” – the combined meaning of the words is interpreted as direction setting management. In 1976, Hewlett-Packard’s Japanese subsidiary was the first known organization to utilize Hoshin, a planning and implementation process which gives direction to an organization. They looked at future strategy through a system of forms and rules designed to encourage employees to take appropriate action when situations arise. During the Implementation and Progress Reviews steps, Hoshin includes an organic, continuous improvement cycle known as the PDCA (Plan, representing plan development – Do, representing implementation and daily management – Check, meaning review and self-assessment – Act, meaning adjusting strategic priorities) Cycle. Another key part of Hoshin is known as “catch ball,” which happens during the Deployment step. Departmental stakeholders “catch” a topic for improvement and through various methods determine an ideal future state, which is then “thrown” back to upper management to review the plan. It’s a top-down/bottom-up approach. Best for organizations with strong departmental and individual contributor capabilities needing to repair process issues or better meet departmental goals, organizations with poor alignment between upper managerial vision and day-to-day operational activities and organizations with disengaged employees. 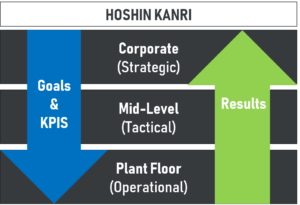 From our experience at ArchPoint Consulting, we believe while aspects of Hoshin can be implemented to better engage employees in strategic planning efforts as a whole, a clearer path to strategic execution through centralized, aligned leadership is required for efficient execution. The 7S Framework was the brainchild of McKinsey business consultants Robert H. Waterman, Jr. and Tom Peters in the 1980s. This model was born out of a McKinsey research project whose development had some unusual perks and pitfalls – infinite budget, first-class travel, meetings with some of the most interesting people of the time, a seemingly traitorous article published by Peters against the idea of strategy (then McKinsey’s main service offering), the prompt firing of Peters after the article was published and the receipt of zero royalties by Waterman from the framework, which heavily contributed to the mega-popular book In Search of Excellence. The premise of the McKinsey 7S Framework is that there are seven internal organizational elements that must be in alignment for success. These elements are divided into “hard elements,” being those that are easy to identify and influence and “soft elements,” those that are more difficult to define and impact. The design of the model is intended to help organizations identify which elements need to change to reach/maintain alignment or achieve a different level of performance. Best for organizations wanting to take a current state assessment to compare against desired state, those going through organizational change or aligning to a chosen strategy and organizations wanting to model the effects of future organizational changes. 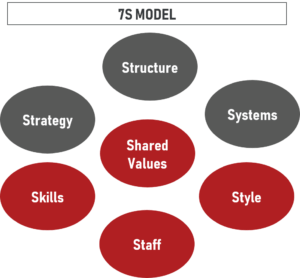 From our experience at ArchPoint Consulting, the 7S Framework is helpful for understanding the organizational implications and resource requirements necessary to deliver a strategic plan, but that it falls short on helping organizations execute and communicate. In 1990, Robert S. Kaplan of the Harvard Business School led a research study with the US-based consultancy firm, Nolan-Norton. Along with David P. Norton, he subsequently published The Balanced Scorecard: Measures that Drive Performance in 1992. 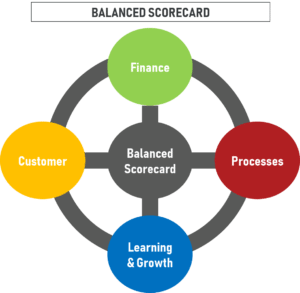 This article included details of a Balanced Scorecard design developed by an independent consultant, Art Schneiderman, for a mid-sized semi-conductor company in 1987. Kaplan and Norton are typically revered as the creators of the Balanced Scorecard, but it is Schneiderman who developed the actual concept. The article was so popular, they published The Balanced Scorecard in 1996, a book credited with the spread of the concept worldwide along with additional articles published by Kaplan and Norton. In the mid-1990s, an improved, second-generation model emerged introducing the utilization of “strategy maps” – illustrations of strategic objectives distributed among the four perspectives. After the mapping exercise, the Balanced Scorecard framework is developed by choosing only one or two measures for each strategic objective, which simplifies the approach. Another iteration was developed later in the 1990s with the introduction of “destination statements” and added functionality to strategic objectives. Designs of the framework continue to evolve to resolve deficiencies with the original designs and fit the criteria of changing business models. Best for organizations that have not had success juggling multiple metrics or any organization who continually struggles to reach its goals. From our experience at ArchPoint Consulting, Balanced Scorecard is most successful when used by organizations with experience in disciplined strategic planning and with at least some key team members having experience using the methodology. 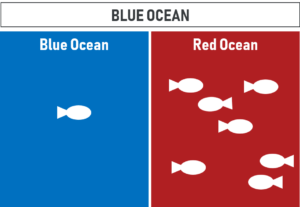 The Blue Ocean theory was developed by W. Chan Kim and Renee Mauborne after conducting a research study spanning 100 years, 30 industries and 150 strategic moves. Kim and Mauborne published Blue Ocean Strategy: How to Create Uncontested Market Space and Make the Competition Irrelevant in 2004 and an extended version of the book in 2015, making the case that instead of fighting for market space in “red oceans” (waters turned red with blood spilled from vicious competition), companies can succeed by creating “blue oceans” which are new market spaces devoid from competition. Blue Ocean provides insight into many strategic frameworks that help create value innovation, one being “strategy canvas,” a tool that helps companies differentiate their product from others. The next phase of Blue Ocean focuses on formulating a strategy based on four principles (reconstructing market boundaries, big picture focus, reaching beyond existing supply and demand, and strategic sequence) while managing across boundaries of competition. Finally, Blue Ocean suggests implementation through tipping point leadership and fair process, while being mindful of organization hurdles that exist politically, cognitively, resource-wise and motivationally that can prevent the strategy from succeeding. Best for innovative organizations, organizations operating in markets with extreme saturation and those looking for a major strategic shift. From our experience at ArchPoint Consulting, elements of Blue Ocean can be used as pre-emptive, thought provoking strategic brainstorming exercises on potential market opportunities, but lacks tangible work plans on how to execute. – Model is complex and requires a long time horizon to implement – think changing existing processes, developing new products, etc. Choosing a strategy framework is an important task, but its importance does not compare to the work involved in strategy execution, one of the biggest challenges we see with our clients. Heeding the advice below can help you maximize your efforts. Do not begin the planning process without a very good understanding of the organization’s current performance, availability and capability of resources and growth potential. Foregoing this critical step can make all strategic planning efforts for naught. 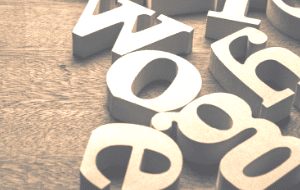 Read how we conduct organizational performance assessments. Many organizations go through the planning process with excitement and vigor and lose energy as soon as the plan is developed. As a leader, you must recognize the need for change management discipline and implement it. The organization cannot be expected to change the way it has always operated without regular reminders and communication from leadership. 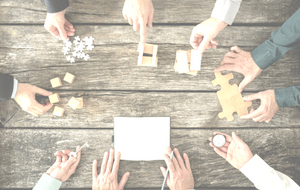 Strategic planning is not project management. Leaders are often surprised when little progress is made months after a strategic planning session. Thankfully, there are many tools that exist adjacent to OGSM and other frameworks that can be easily implemented. myOGSM is one of the tools we recommend. At ArchPoint Consulting, we know a plan that stays on paper is a failed plan. We’re passionate about strategy and its execution to fundamentally change how a business operates. 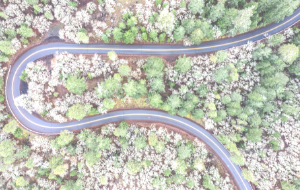 Our team is here to help you get back on track whether it’s starting from scratch or implementing tools to successfully deliver on your priorities. Contact us today.